Our mission is to inspire, educate, and promote sustainable practices throughout our community. Simply put, we take food that people don’t eat and turn it into soil to grow more food. We provide composting services for homes, businesses, and events. Beyond that, we offer consulting for events and businesses to find ways to minimize their waste, and reduce their impact on the environment. We believe every little bit matters. Together, we can make Tampa Bay a more sustainable community. 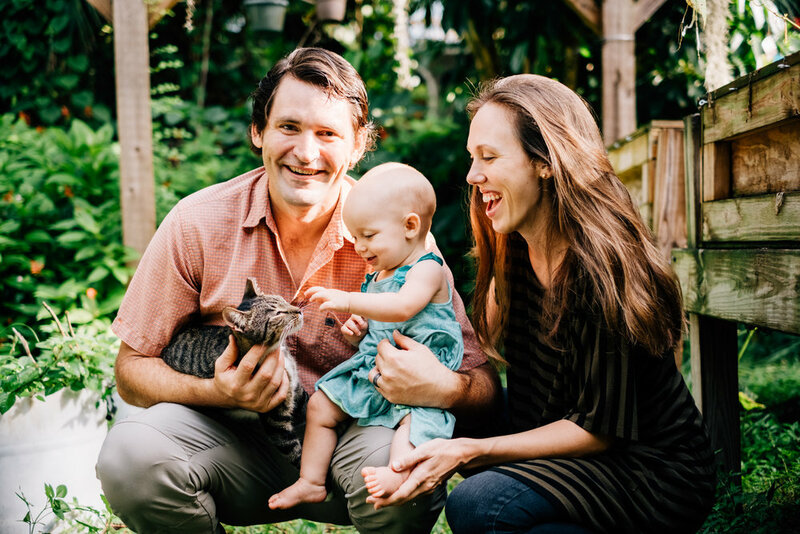 Suncoast Compost founders Paul and Kali met eight years ago in Tampa, traveled the world, and planted roots in Riverview, Florida. Neither of them predicted their transformation into professional maggot farmers, yet here we are. Paul is a former marine biologist and current biology professor at Hillsborough Community College. He earned a microbiology degree from UF and a masters in molecular biology from USF. Kali has a background in arts and education, and earned her masters in Educational Leadership from USF. She taught theater with Hillsborough County Public Schools for several years and now occasionally performs in local theater productions. When they aren't composting, you can find Paul and Kali in their garden or sipping coffee on the porch with their daughter. Interested in collaborating or bringing our composting services to your workplace or organization? Reach out and let's talk about it.